When you think about toxic waste you’re probably thinking of big chemical factories churning out industrial waste. You probably never think that your very own body is a host of many toxins and metals. Inhalation: The air you breathe in every single day is contaminated and full of toxins. People who work or live close to factories or industrial areas are more prone to toxic inhalation. Ingestion: Did you know that most common way to get toxins in your body is by eating processed foods, food that have preservative and canned foods. Most people go to the store and by the bust looking produce not even realizing that it’s laced with pesticides. Also eating in areas that are contaminated will also increase the amount of toxic ingestion. Absorption: the skin and eyes on every person’s body can take in many airborne toxins every single day. Skin care products also contain a good amount of toxins that your skin absorbs. Toxins interfere with the body’s proper functioning and, in the end, may even prove fatal. Over time, the accumulation of toxins in the body may contribute to severe skin, eye and stomach infections, tumors, asthma, neurological diseases, heart complications, biological mutations and infertility. It is important to know your body in order to respond to its distress calls. 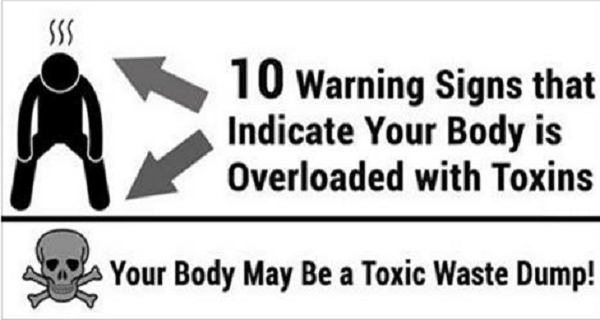 Here are the top 10 warning signs that indicate your body is overloaded with toxins. The colon, or large intestine, is responsible for processing toxins and eliminating them through regular bowel movements. However, when the colon becomes unhealthy, it cannot properly eliminate all the waste materials from your digestive tract. This leads to buildup of waste matter along the wall of your colon or in the pockets of the colon, which in turn causes constipation as well as gas and bloating. Constipation means your bowel movements are not regular and stools are hard and require straining. To treat constipation, try drinking more water, exercising daily and including probiotics and fiber-rich foods in your diet. Being exposed to harmful chemical and toxins can cause a lot of damage to the body, one being natural weight control mechanisms. With little exercise, bad eating habits, exposure to harmful toxins will lead to obesity. Toxins are able to change your body’s natural hormones, it can cause it to sow down drastically of stop it all together. When hormones are affected by an overload of toxins it can also cause problems with thyroid, estrogen, testosterone, cosrtisol and also insulin. The thyroid gland controls the metabolism by secreting fat burning hormones. Toxins can block these hormones and causes weight gain. When a person consumes unhealthy foods the sugar climbs drastically. Insulin moves the extra sugar from the bloodstream in to the cells for later use. A 2015 study published in Environmental Health Perspectives evaluated children of women exposed to airborne and ingested pesticides during pregnancy. Results found a direct correlation between toxins in the mother’s womb and obesity in their children by age 7. If you are constantly tired, you might be experiencing toxin-induced fatigue. The body breaks down food in the digestive tract to acquire nutrients essential for energy production. When toxins accumulate in the digestive tract, they slow down the breakdown of food. This causes us to feel tired, fatigued, sluggish and low in energy. Whether it is digestion, bowel movements or hormone secretion, toxins meddle with every system of the body. This induces a stress-response causing the body to work twice as hard to perform basic functions. This gradually weakens the immune system, which is one of the major causes of fatigue. A 2001 study published in Science of the Total Environment notes that five patients with chronic fatigue syndrome in Italy (average age of 37.5) showed a damaged immune system due to excessive exposure to food and environmental toxins. Skin on the body works as a detoxifying organ. When there are too many toxins in the intestines or the liver can’t eliminate the toxins, the skin then begins to get rid of the toxins. When the skin detoxifies it cause the skin to have rough rashes or it begin to sweat excessively to fight against the toxins. Skin problem tend to happen when there are too many toxins in the body and the body doesn’t have any other way of eliminating them. During this process the toxins will clog the pores and can cause other horrible reactions. No matter how it is absorbed either from skin care or cosmetic products, food and air, toxins is the main reason for acne, inflammation, eczema, wrinkles and dark circles. A 2002 study published in the Annals of Epidemiology reported high clinical depression in farmers and their spouses exposed to environmental toxins via pesticides in Colorado. If you find yourself depressed often, it might be due to food and environmental toxins accumulating in your body. Environmental, topical and food toxins attack the central nervous system and settle there. These toxins cause our brain tissues to become overly sensitive. Therefore, when we exert our brains in response to some stimuli, it causes a searing pain through our brain tissues. This is what we generally describe as a migraine. Furthermore, the body has its own toxin-producing mechanism. The nerves may release waste materials and chemicals, such as nitric oxide, into the central nervous system. High levels of nitric oxide in the body have been found to trigger migraines. A 2009 paper published in Clinical Science concludes that pollution, exposure to environmental allergens and exposure to chemicals may provoke headaches in susceptible individuals. Toxins that are processed foods, foods with additives and artificial ingredients, can affect your mood in bad way. Xenoestrogen which is in food additive is a toxin that disturbs the natural estrogens in the body by acting just like it. This additive tends to cause extreme moods swing from depressed to over happy, furious to nothing every happening. Another additive that messes with a person mood is aspartame; it releases toxins that lead to extreme depression disorder. A 2013 study published in Neurology studied the effect of sweetened drinks in American adults, noting that drinks containing aspartame caused a higher risk of depression. If your breath constantly reeks and brushing your teeth does not help, the problem might not be your teeth but your digestive system. The digestive tract is home to a mix of friendly and harmful bacteria. When we consume processed food, we introduce a rush of carbohydrates in the body. The carbohydrates break down into excessive sugar, upon which the harmful bacteria thrive and grow. These bacteria give off toxins that deposit in our digestive system and mouth, inducing a filthy smell. A white plaque buildup may accompany toxin-induced bad breath. Excessive burping is also a vent for bad breath and an added symptom of intestinal toxicity and indigestion. Furthermore, bad breath may also indicate problems in the kidneys, which are responsible for removing toxic chemicals from the blood by creating urine. You can develop muscle pain and spasms without an actual injury due to excess toxins in the body. Constant exposure to toxins from food products, household cleaning supplies, cosmetics, and the environment activates the immune and the stress-response systems. This strains the body’s stress-defense mechanism, gradually weakening it. This leads to excessive stress affecting every organ in the body, including the muscles. Stressed muscles constrict capillaries, obstructing smooth blood flow through the muscles. This causes oxygen deprivation and further strain. When the muscles try to resist the stress and overexert themselves, it may cause physical pain. Muscle pain accompanied by fatigue is one of the most common symptoms of a toxic overload. Massage therapy can help to overcome muscle pain and spasms. People working on farms and in factories, people consuming processed foods regularly, and people living in houses with toxic lead paint on their walls or using detergents and air fresheners that contain lead may suffer from insomnia. The central nervous system is able to readily absorb certain substances. These substances are lipophilic toxins – they absorb quickly into the blood – and travel to the brain, settling there. The presence of these toxins in the brain causes sleep disorders. Since the brain flushes out toxins when we are asleep at night, insomnia further inhibits detoxification. If you suffer sleepless nights and cannot explain why, your body may be trying to tell you to unload the toxins. hen there is a toxic buildup in the body, it naturally means that the digestive system is unable to function efficiently. This leads to a toxin-laden flow of blood from the digestive tract to the liver. The liver then exerts itself to purify the blood. An overworked liver usually shows symptoms like a spike in body heat and excessive perspiration. While sweating is a great way to rid your skin of toxins, excessive sweating might just be your body’s way of telling you it is working extra hard to unclog your system.